A unique aspect of the PEACH study is its focus on the 10K or 6.2-mile event since most research evaluating recreational runners has focused on the marathon distance of 26.2 miles. Researchers at the Emory University School of Medicine are teaming up with the Atlanta Track Club to study the effects of exercise on the heart. The goal of the study, locally referred to as Promoting Endurance Exercise in Atlanta for Cardiac Health (PEACH), is to assess the impact of age, gender and fitness level on cardiac function after completing a moderate, but exhaustive, endurance-exercise event. PEACH, led by Jonathan Kim, MD, assistant professor of medicine (cardiology), Emory University School of Medicine, is following approximately 80 healthy AJC Peachtree Road Race runners before and immediately following the annual 10K event in Atlanta on July 4. The popular race, organized by the Atlanta Track Club, is the largest 10K in the world with 60,000 runners expected to participate this year. "We know that exercise is medicine and that it's good for you, but we are still learning about the effects of exercise on the heart, particularly how exercise impacts the efficiency and mechanics of the heart," says Kim. PEACH focuses on young athletes (ages 18-20) all the way to older athletes (ages 70 and up), as well as middle-aged athletes (ages 45-50). Runners are stratified by age and fitness level. "We are looking at the extremes of age since no one knows how the youthful 18-year-old heart compares to the heart of a master athlete over the age of 70," explains Kim. Before the race, study participants are training at their own pace and keeping an activity log to capture their pre-race training exercises including the number of miles run and other aerobic activities like swimming and biking. One or two days before race day at the Peachtree Expo event, each participant will undergo an EKG, echocardiogram (or ultrasound of the heart) and blood draw. These tests will be repeated again immediately following the race in a medical tent near the finish line. According to Kim, pre- and post-race results will likely show changes in heart function among the participants. Researchers will be eager to learn whether or not faster, fitter people get more protective effects from regular exercise than do those who are less fit. 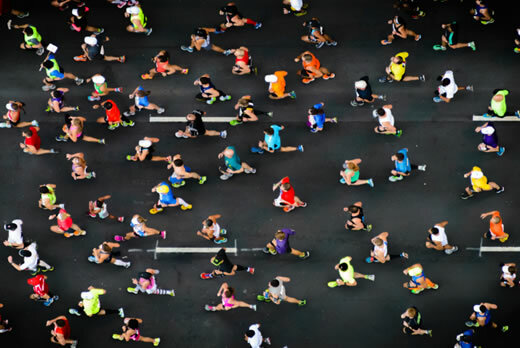 "Marathon runners are really a select group of athletes who are not necessarily an accurate representation of the general public engaging in endurance activity," Kim says. "The Peachtree includes the average runner, more or less, so this is a perfect opportunity to study a population that hasn't been as well tapped into in the realm of sports cardiology research. And understanding the normal heart helps us better understand the diseased heart." Before joining the Emory faculty, Kim earned his bachelor's degree at Emory in 1998 and completed his internship and residency at Massachusetts General Hospital, where he was first inspired to pursue sports cardiology by Aaron Baggish, MD, a co-medical director of the Boston Marathon, who is world renowned for his research in exercise physiology, marathons and sports cardiology. Baggish is also one of the co-investigators in the current PEACH study. When Kim returned in 2011 to Emory for his cardiology fellowship, he turned his sights toward the study of runners participating in the Peachtree. In addition to Kim's research team at Emory, PEACH is made possible through the collaboration of multiple partners including the Atlanta Track Club (including the current Medical Director, Joe S. Wilson, MD, and Executive Director, Rich Kenah), Peachtree Road Race medical sponsor Northside Hospital, multiple volunteers, and Digirad UltraScan Solutions, the company supplying staff to perform the imaging tests before and after the race.